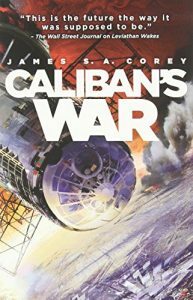 I read Leviathan Wakes because I really enjoyed The Expanse miniseries. I suppose that’s the root reason I read Caliban’s War, too. But I almost put it down after the first couple of scenes. I’m glad I didn’t, but it was close. My reason for almost abandoning the book is one of personal taste. I’ve said before here and there that one of the fastest ways to lose me as a reader (or a viewer) is to kill a kid while I’m reading (or watching). Not interested. Find another way to tell the story or tell a different story. Caliban’s War starts with a kidnapping and then follows that with a marine platoon getting destroyed by a child-sized engineered creature which, just at the right time to save a POV character, more or less self-destructs. After that, the story merges into the regular universe and we get all of the great elements from Leviathan Wakes, political tension and potential outright war between rival political powers, a mystery to be solved, realistic representation of a settled solar system and the technology that it takes to maintain things, characters you can care about, and an incomprehensible alien issue, now taking over Venus. The alien issue is part of the scenery in this story, brought up just often enough to remind us that it’s there, it’s important, and we will be coming back to it. And people shouldn’t go to Venus. This second book in the series also brings us one of my favourite characters from the series, Chrisjen Avasarala. The TV series tones her down a bit, but you get the full Avasarala in the book, the political expert with a mouth like a longshoreman and grandmother who will do whatever it takes to keep her world safe, because that will keep her family safe. We also get a great character in Bobbie Draper, the martian marine suffering from PTSD who risks being branded a traitor to Mars by going to work for Avasarala in the cause of stopping the war that’s trying to break out. Overall rating: 4.5 stars. I’m glad I got past those first couple of scenes, but as much as I enjoyed the book, those almost blew it for me. Persevere and you’ll be rewarded by a great story. I stumbled across the book, Leviathan Wakes, a few years ago and really enjoyed it. I did it the other way around. Looking forward to the new season of the show, though we don’t have cable anymore so I’ll have to stream it from Space. Book 3 in the series is on my reading list for this year.